Most people don’t even know that Barker Brook exists, and the owners there may well just like it that way. 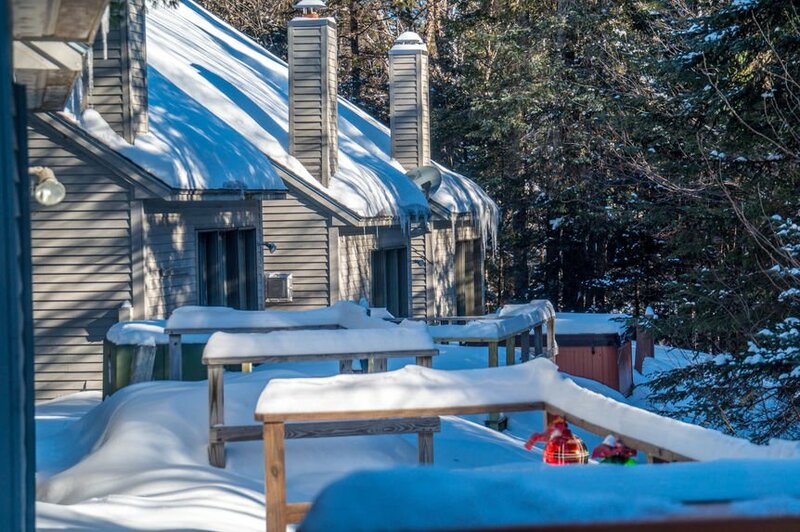 Nestled in the most private location of any of the condominium complexes within the Sunday River Road, and just a five minute drive to the South Ridge base lodge, Barker Brook is located in the back of the Coombs Village neighborhood. The two buildings in the development are shrouded with lofty evergreens and sit along the Barker Brook, hence its name. With spacious decks off the back of the units, owners can enjoy the sound of the babbling brook while relaxing in an optional hot tub. There are two buildings, Spruce Terrace has three units, and Pine Terrace has four units. The bi-level units have skylights and are very light and airy, even on the cloudiest of days. The units have an open kitchen, living and dining area with vaulted ceiling, and a three-quarter bath on the main floor. The laundry hooks up are either in a kitchen closet or off a separate room within the garage. There is also a nice mudroom entry with large storage closet. Upstairs, the units have two spacious bedrooms, and in some cases, the owners have also closed in a loft area to create a third sleeping space. There are even some who have made use of a very large closet area for a single-bedroom, though be aware that these last two set-ups are not considered legal bedrooms. There is a spacious full bath on this floor as well. Owners who wish to rent short-term can do this on their own or through a rental agency such as Vacasa. Property listings for Barker Brook Townhomes.